Make a sweet and colorful marshmallow topped cake for the Easter holiday. 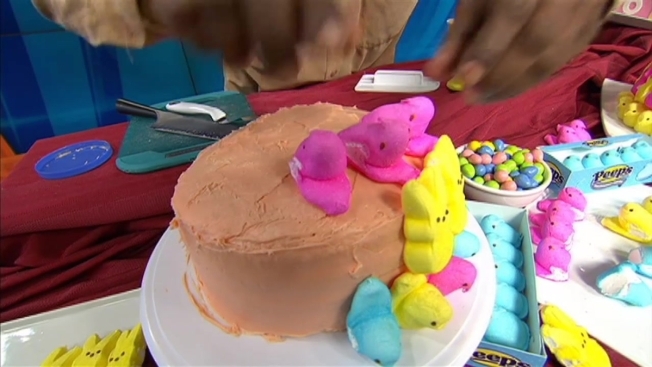 Every year my friend Stephen Brinkman makes a themed cake for Easter featuring peeps, those day glow marshmallow treats that only appear on shelves during this time of year. His “hot tub” peep was such a hit with his friends, It inspired me to share some ideas so that you can make one of your own. The first is a basic cake that should be easy for anyone to create. The second is actually my interpretation of Stephens original cake. The last one is a bit more time consuming, but makes an impressive presentation. Prepare cake in two 8” round cake pans according to package directions. Remove from oven, place on a wire rack and cool completely. Using a long knife, carefully slice each cake round into two equal disks. Place a bit of frosting on your serving plate and press one of the disks, cut side up, into the frosting. Cover the cut surface with a thin layer of frosting and add another disk. Repeat with remaining disks. Cover the sides and top of the cake with a generous amount of frosting. Starting at the bottom, place one row of chicken peeps side by side all around the cake, pressing them into the frosting. If you have a combination of colors, alternate them as you place them on the cake. Next, place a row of rabbit peeps just above the chicken peeps and, if you have multiple colors, alternate the colors as well. These two rows should cover the side of the cake. For the top, place a rabbit peep on top with the ears facing the center and the bottom just touching one of the rabbit peeps on the side. Add another rabbit peep, but space it so its bottom is about 1” away from the first but the ears are still touching. Repeat until you’ve covered the top of the cake. Filling the spaces with jelly beans. For a “Hot Tub Cake”, use 6” baking pans to make a much more vertical cake. You’ll also need 5 packages of King Size Kit Kat Bars, about 6-8 rabbit peeps, two cans of white frosting and blue food coloring. Bake the cakes according to package directions. Remove from oven, place on a wire rack and cool completely. Slice off the “dome” of each cake so that you have two perfect disks. Meanwhile, separate each Kit Kat with a sharp knife so that you have a clean cut between them. Set aside about 1/4 cup of frosting for optional extra decorating of the cake. Place bit of the remaining frosting on your serving plate and press one of the disks, cut side up, into the frosting. Cover the cut surface with frosting and add the top disk. Cover the top and sides with a medium layer of frosting. Add just a drop or two of blue food coloring into the remaining frosting and swirl once or twice with a spatula to create blue and white streaks. Generously cover the top of the cake with this blue-white frosting. Place a Kit Kat bar vertically on the side of the cake with one end just above the blue-white frosting. Place another bar next to the first, leaving no space, and press it into the frosting. Repeat until you’ve completely covered the side of the cake. Using a sharp knife, cut the rabbit peeps at about their “waistline” and push them into the frosting on top, angling them a bit as if they were partially submerged in the water and resting against the Kit Kat bars. If you want to add more to this cake, take one of the “domes” and cut a half circle into it using the 6” cake pan as I guide so that the resulting crescent will fit up against the cake. Frost this piece with green frosting (using a combination of yellow and blue food coloring mixed into the 1/4 cup of reserved frosting). Place two or three rabbit peeps into this mound to simulate a few peeps in the grass getting ready to get into the hot tub. This cake is a bit more time consuming and not easy to fully detail in print, but I will provide a bit of a description of how it was created: The cake actually uses two cake mixes and 8” square baking pans. Once baked, three of the layers are stacked and frosted to form the “box” and the last one is frosted to from the “lid”. Then, they are covered with rolled fondant. The center portion of the top of the box is cut out and about 1” of cake is removed to form a pit. That pit is frosted and then filled with rabbit peeps that have been cut at the head (only the head and ears are placed in the pit). Then additional fondant is added to both the box and lid to simulate ribbon and decorations. The box is the placed on a serving platter and the top is place up against it with additional ribbon extending out from it and wrapped around a few “peep” helper trying to put it on the box.